Great Lent in the Orthodox Church requires a much greater commitment from believers than its Western counterparts. March 7 is the beginning of Great Lent (Великий пост), the most important fasting season in Eastern Orthodoxy. Like Lent in the Western church, it takes place during the six weeks before Easter. Unlike in the Western church, the Orthodox calendar counts Lent as the 48 consecutive days before Easter, not excluding Sundays. 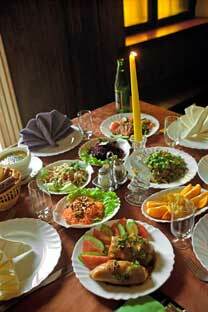 Great Lent is the best time to be a vegetarian in Russia. Nearly every restaurant has a Lenten menu, and meat isn’t the only thing missing from these dishes. The fasting rules of Orthodoxy are derived from the monastic rules for fasting, and during Lent, Orthodox believers are to abstain from eating all meat and dairy products and, on most days, from using olive oil and alcohol, although these things are allowed on Sundays and some other days. Fish is also occasionally allowed. Lent is a time when Orthodox believers are nourished by prayer and reflection rather than by food. One Orthodox website says that Lent "is an opportunity to free ourselves from the sinful desires and urges of our fallen nature, and to nourish our souls with prayer and repentance." Restricting food choices is intended to give believers more time to focus on spiritual matters. Ironically, trying to follow an Orthodox fasting diet often has the opposite effect. The fast was not established in our era of overprocessed food. The believers who developed the fast thought of it in a purely spiritual way. And yet, it has secular implications, too. Following the prescriptions of the fast forces you to have a closer relationship with food, to return to the kitchen. In the United States at least, you can't get a fast-sanctioned meal at a fast-food restaurant. The limitations on eating prescribed by the fast echo the words of the food journalist Michael Pollan - Eat food. Not too much. Mostly plants. The Orthodox calendar and fasting rules force believers to live seasonally—even in a world where all types of foods are available at all times. For additional general information on Great Lent in the Orthodox church, which involves things like self-examination and repentance as well as fasting, I recommend this wikipedia article and also this link from the website of the Orthodox Church in America.